Concert in Scarlets “A Performance Like No Other” Article by 28560 OCdt (II) Bennett Dickson Photos by RMC Photo Club This past Saturday (April 6th), the Royal Military College of Canada held the Concert in Scarlets, an event that showcases the musical capabilities of the different branches of RMC’s band. Featuring pipes, drums, brass instruments, a choir, and much more, the concert promised to bring a performance like no other. The concert acted as an opportunity to improve on how they performed during the Winter Concert that took place last year. Each member of the team realized where they might’ve been lacking and used that to build upon their performance, both as individuals and as a group. I had the pleasure of speaking with one of the bagpipers, 28510 OCdt Cartier-Nicol, and got his view on the performance. He took me through the preparations that were put in place before the concert. Three times a week, the band would get together and practice at 0615 for an hour. On top of that, each member put in countless hours of practice during the mornings and evenings of their “off-days”. They focused on the various songs they’d be performing and get a solid understanding of how the concert was to go. The week immediately before the concert, they practice every day to ensure that they had it right. When it came to how he felt, Cartier-Nicol told me that he loved performing in the concert and made him feel like he was a part of a team. He’s not too sure where the band will go from where they are now, but one thing was certain: he loves what he does and he’ll continue to do it in the years to come. I’d like to personally congratulate all of the members/performers on a great show and let them know that the concert was met with positive feedback from everyone. If you missed the concert, catch the livestream here! And check out the RMC Photo Club’s Flickr page for plenty of photos! *** RMC Premieres “Ti-Gars” Film / le CMR a présenté le film «Ti-gars» Article by / par 25366 Anna-Michelle Shewfelt On Monday, April 1, RMC premiered the film “Ti-gars,” which tells the story of the gender-transition of Corporal Vincent Lamarre through his hormone therapy, legal change of identity, and surgeries. The film is an eye-opening look at just what it means to be trans and just how the Canadian Forces are working to support trans service members. As RMC Commandant BGen Sebastien Bouchard said, “This is the story of someone who was supported by the system. In the CF, it’s not about your gender identity or your sexual orientation. It’s about what you bring to the fight. And a good corporal is a good corporal.” Corporal Lamarre, who took questions following the film, explained that while his experience in the CF has been positive there is still work to be done. “The units I’ve been with have all been extremely supportive, but it’s always a concern when I post somewhere new.” // Le lundi 1 er avril, le CMR a présenté le film «Ti-gars», qui raconte l’histoire de la transition sexuelle du caporal Vincent Lamarre par le biais de son hormonothérapie, de son changement d’identité et de ses interventions chirurgicales. Le film offre un regard révélateur sur ce que signifie être trans et sur la façon dont les Forces canadiennes s’emploient à soutenir les membres des services trans. Selon le commandant du CMR, le Bgén Sébastien Bouchard: «C’est l’histoire d’une personne appuyée par le système. Dans les FC, il n’est pas question d’identité sexuelle ni d’orientation sexuelle. C’est ce que vous apportez au combat. Un bon caporal est un bon caporal.» Le caporal Lamarre, qui a répondu aux questions après le film, a expliqué que, même si son expérience dans les FC était positive, il restait encore du travail à faire. «Les unités avec lesquelles je suis allé ont toutes été extrêmement favorables, mais c’est toujours une préoccupation lorsque je poste quelque chose de nouveau.» *** Article and Photos courtesy of RMC Public Affairs RMC’s historic clock tower was given a facelift on the night of April 4 by unknown assailants. An #RMC crest was placed over the clock tower’s south face, and a team crest was put on the west face by the group. RMC’s #Sandhurstteam departs Sunday for West Point to compete against more than 50 military skills teams from around the world in skills such as rappelling. Bravo Zulu and good luck. #Skylark #TruthDutyValour #Sandhurst2019 // Article et photos avec la permission de RMC Public Affairs La tour de l’horloge historique du CMR a reçu un renouvellement la nuit du 4 avril par des inconnus. Un emblème du CMR a été placé sur la face sud de la tour de l’horloge et un emblème d’équipe a été placé sur la face ouest par le groupe. L’équipe du CMR à #Sandhurst se rend dimanche à West Point pour affronter plus de 50 équipes d’habiletés militaires du monde entier dans des domaines tels que la descente en rappel. Bravo Zulu et bonne chance. #Skylark #TruthDutyValour #Sandhurst2019 *** RMC wins IEEE competition / Le CMR gagne le concours IEEE Article and Photo courtesy of RMC Public Affairs Congratulations to the team of OCdt Jennifer White (left) and OCdt Michael Brownlee whose project “ASL Training Aid” was awarded first prize at the IEEE Eastern Ontario Oral Student Paper Competition on April 1 in Kingston, beating out strong entries from Queen’s University and Carleton University. // Article et photos avec la permission de RMC Public Affairs Félicitations à l’équipe des élèves-officiers Jennifer White (à gauche) et Michael Brownlee dont le projet « ASL Training Aid » a été récompensé par le premier prix du concours annuel d’exposés d’étudiants de l’IEEE de l’est d’Ontario, le 1 er avril à Kingston, en battant des projets forts de l’université Queen’s et de l’université Carleton. *** Mech Eng and Aero Eng Fourth Years Present Their Theses Article by 27467 OCdt (IV) Daniel Zhao The mechanical and aerospace departments had their thesis presentation on Monday and Friday last week. They applied the knowledge learned during their four years at RMC in addition to extra-curriculum research. For the mechanical side, students were formed in teams of 2 to 3 and applied the engineering design process from beginning to finish, from creating new concepts to manufacturing the final product. 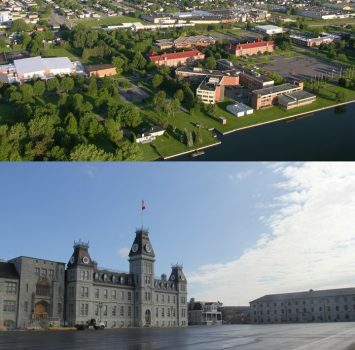 Those teams were able to prove their concept in front of their peers, department professors, members of the training wing, and even the commandant, BGen Bouchard who was a mechanical engineering student himself back in his time at RMC. The subjects for the 2019 thesis presentations were: 1) Design of an armor defeating artillery projectile; 2) Design of an electric propulsion system for a small spacecraft; 3) Advanced design of a rolling road for the RMC Wind-tunnel; 4) Design, Modelling, and Prototyping of a Mobile Platform; 5) Design and construction of a 3 DOF SCARA Robot; 6) Re-design of a thermoelectric ice making machine; and 7) Energy extraction from a free-oscillating wing. The aerospace engineering team, namely the Mooseworks company, was composed of students that learned to become experts in a specific domain, including aerodynamics, furtivity and detection, structure analysis, cost analysis, tactical analysis, computer-aided design, etc. Heads of engineering companies and professional engineers, in addition to members of the college, were invited to the presentation. The students were able to convince them of their new design and proved that they have met the given requirements for a new CAF cargo plane. This plane would be able to fly to Mali from Trenton in a single flight with plenty of fuel in reserve while traveling at subsonic speeds, even carrying two CH-146 Griffons or one CH-146 Chinook. The performance of the plane stated by Mooseworks were comparable to the C-17 Globemaster and better than the 130J Hercules as it was said confidently: “Anything the 130J can do, we can do it better”. The presentation ended with a question period where the audience challenged members of the design team about technical details, design decisions, real-life applications of the product and future improvements. The question gave insight to the students about other design implications and the big picture of what it meant for a real engineering company. Overall, the presentations of the Class of 2019 were successful and gave an example for their juniors to follow. *** The Week That Was In Professional Development With thanks to 27467 OCdt (IV) Daniel Zhao, CWIIO Third Year – 27897 NCdt Christina Pongetti The Third Years were directed by CWO Keating, our Training Wing Sergeant Major, this week. We practiced using our drill voices in order to prepare for being on parade both as Fourth Years in the coming year and as officers after graduation. It is important that we practice this because as officers, we need to have a commanding presence on the parade square in front of our troops. CWO Keating gave us helpful tips on the tone and pitch of our voices for the different parts of a word of command. Afterwards, we had some fun and marched around the parade square repeated lyrics from a song CWO Keating was singing.